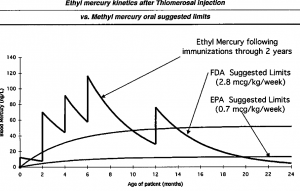 Background: Peter Patriarca, an FDA employee, admitted back in 1999, in a confidential e-mail obtained through FOIA, that, “… the greatest point of vulnerability on this issue is that the systematic review of thimerosal in vaccines by the FDA could have been done years ago and on an ongoing basis as the childhood immunization schedule became more complex. The calculations done by FDA are not complex. I’m not sure if there will be an easy way out of the potential perception that the FDA, CDC and immunization policy bodies may have been“asleep at the switch” re: thimerosal until now”.